[toc]When the tear gland malfunctions and your tear film which is a fluid cover over the eyes breaks down, then you are faced with the problem of dry eyes. Dry eyes are a difficult and cumbersome problem to deal with. However, there can also be a quick and effective solution to this problem other than medication. Dry eyes can be managed quite effectively by resorting to herbal remedies. Some of the best methods to cure dry eyes involve the use of herbs. However, you should also consult a medical health care professional before taking any of the herbal remedies for this problem. 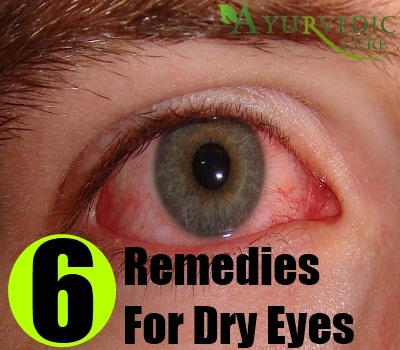 This article covers some of the top herbal remedies for dry eyes. 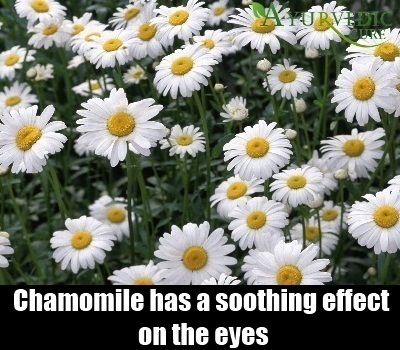 Chamomile is an excellent way to sort out the problem of dry eyes. Known for its anti-inflammatory properties, Chamomile has a soothing effect on the eyes. It is a good remedy for dry eyes and it ensures that the eyes are able to regain moisture again. You can use dried Chamomile herb or teabags containing this herb for making a solution to treat your eyes. Boil the dried herb or teabag in 750 milliliters of water and strain the liquid once it boils. Then wait for the solution to cool. Following this, dip a compress into the solution and place it over your eyes. Continue this treatment until your eyes have become healthy again. Also known as Foeniculum Vulgare, Fennel is a wondrous herb which can quickly and effectively solve the problem of dry eyes. This aromatic herb has many medicinal properties. Native to the Mediterranean region, root extracts of Fennel are used to cure vision problems. 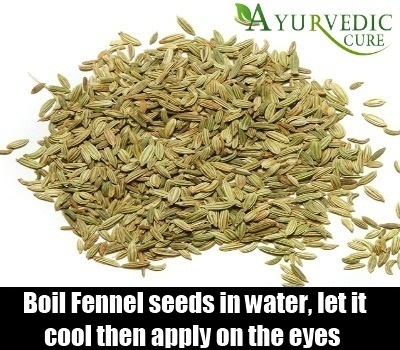 A common herb in various cuisines, Fennel can be used to help cure dry eyes. Soak 1 tablespoon of Fennel seeds in 1 cup of hot water for about 20 minutes. Then drain the seeds and strain the liquid. The liquid should then be allowed to cool and you can then soak pads in this solution and apply it on your eyes for quick relief from dry eyes. 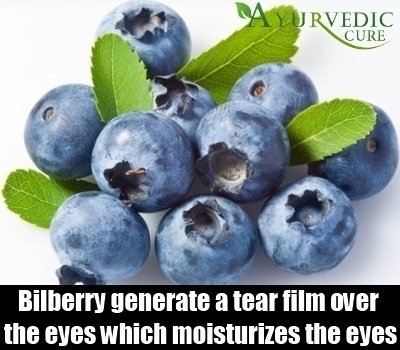 Bilberry is a herbaceous shrub which is related to blueberry is an effective cure for dry eyes. It is even used for retinal disorders such as macular degeneration. Bilberry cures dry eyes by restoring functionality to the tear glands responsible for generating a tear film over the eyes which moisturizes the eyes. Bilberry also contains citrin which makes it an effective herbal remedy for itchy and dry eyes. Anthocynadins are the phytochemicals contained in Bilberry which restore vitality and good health to the eyes. You can take Bilberry in capsule form. Tea made from Bilberry leaves may also be taken to cure dry eyes. 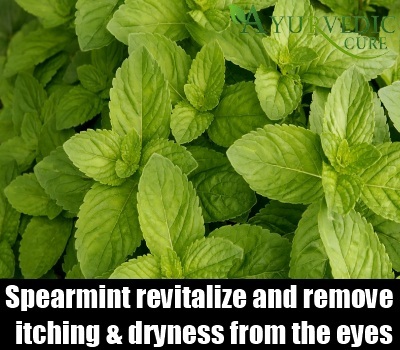 Spearmint can also be used to restore moisture to dry eyes. You can soak the leaves of this herb in hot water, strain the liquid and ensure the liquid cools. Once it reaches a lukewarm state, place a cotton cloth into the liquid and apply it directly on the closed eye lids. The menthol in this strained liquid actually stimulates the production of tear film which is the moisture in the eyes. Menthol also refreshes and stimulates the eyes, revitalizing them and removing the itching and dryness. Spearmint solution is an ideal cure for dry eyes. 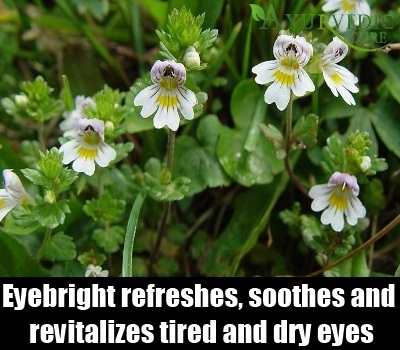 Eyebright is a powerful medicinal herb which is commonly used in healing dry eyes. Also known as Euphrasia, it is called Eyebright colloquially because it refreshes, soothes and revitalizes tired and dry eyes. It can even be used as a cure for various eye related conditions such as conjunctivitis, eye strain and various other eye ailments. This herb is a very wonderful herbal remedy for dry eyes because it possesses astringent properties. Eyebright herb can be heated in water till it dissolves and then you can strain this liquid and use it on a compress for healing and soothing dry eyes. This herb revitalizes the eyes and ensures that a person is able to regain normal moisture in the eyes. Also called the Wolfberry, this herb is found in Asia, specifically China. It is part of traditional Chinese medication for eye problems. Goji Berries can be dried and eaten like raisins. They can also be eaten raw or added to the dishes to gain the benefit of healthy eyes. They are also commonly consumed in the form of teas and juices. 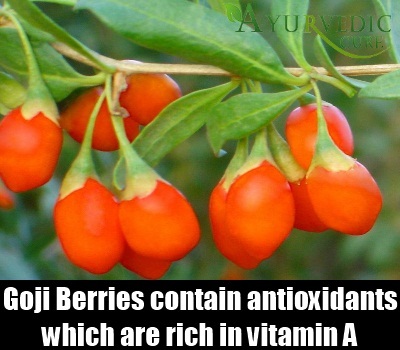 Goji Berries contain antioxidants and they are rich in vitamin A as well. This makes them a very effective herbal cure for dry eyes. When consumed in moderation, Goji Berries are a completely safe herbal remedy for dry eyes.